When Burnley sold Billy Elliott to Sunderland in June 1953 manager Frank Hill set about finding a new winger ahead of the 1953/54 season. He turned to an already established player with over 160 league games under his belt, Chelsea's Billy Gray. Gray, from Co. Durham, had spent four successful years at Stamford Bridge before making the move to Turf Moor in a £16,000 deal. Having impressed in local football, playing for Dinnington Colliery in the Newcastle and District League, he was offered trials with both Wolves and Gateshead but neither came to anything. But in the summer of 1947 the 20-year-old Gray signed for Leyton Orient and he made his Football League debut for them in Division Three South. He was with the Os for almost two years but in March 1949 took the step up to the top flight when he signed for Chelsea. Playing on either the right or left wing he became a fixture in the Chelsea side. He played in a side that twice reached the FA Cup Semi-Final and such was his form that he was spotted by the England selectors and he played for England 'B' in a 5-0 hammering of Switzerland in January 1950. It proved to be his only international honour but there would be more success for him in the FA Cup some years later. Gray had become a massive favourite with the Chelsea crowd and the move to Burnley came out of the blue in August 1953. It was a step up though, Chelsea had just ended the season a point clear of relegation whilst Burnley had ended the season in sixth place in the First Division. Hill felt Gray was just the player he wanted, a quick winger with an ability to score goals although there had been little evidence that he was prolific in front of goal with just thirteen league goals to his name. It didn't take too long for Hill to be proved right. Gray went straight into the team and in the fourth game of the season he scored twice in a 4-2 win over Sheffield Wednesday, one of them from the penalty spot. In the very next home game against Spurs we won 4-1 and he grabbed himself a hat trick. Gray went on to score no fewer than nineteen league goals in that first season when he was an ever present in the side and also scored the last goal in the remarkable 5-3 FA Cup win over Manchester United. 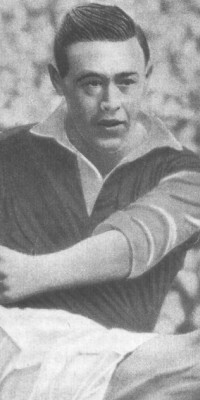 He was first choice on the right wing for almost three seasons but in March 1956 lost his place to the up and coming Doug Newlands. He'd missed just two games since signing for Burnley but Newlands played the last eleven games of what was Gray's third season at Turf Moor. He returned for the first two games of the 56/57 season but in all made just seven appearances including the last game of the season at Blackpool on May Day 1957. That proved to be his last Burnley game and that summer, now past his 30th birthday he moved on to Nottingham Forest. For many players of that era passing thirty meant that the end was close but not for Gray who went on to play in the top flight of English football for another six years. Converted to an inside forward by Forest before eventually moving to full back, Gray moved his career on with an FA Cup winners medal and European action. He played inside right in the Forest side that lifted the FA Cup against Luton in 1959 and in 1961 was at full back as they had a less than successful first entry into Europe, losing in both legs of the first round of the Inter Cities Fairs Cup to Valencia. He played over 200 league games for Forest, a remarkable achievement, and played his last game for them in April 1963. In November of that year he moved on to Millwall as player/manager and his twenty games at the Den took him past 500 career league appearances. Millwall were relegated in his first season but he brought them straight back up and in the following season were on the verge of a second successive promotion when he suddenly resigned in April 1966. He went on to manage both Brentford (where he replaced Tommy Cavanagh) and Notts County then worked as a coach at Fulham, but his last job in football was back at Nottingham Forest where he was groundsman during the 1970s. I wrote that Gray had been a massive crowd favourite at Chelsea, and so he was at both Burnley and Forest. He was a winger full of tricks and linked up well with Jimmy McIlroy in the Burnley side of the time but the emergence of Newlands led to his departure and one that in the end led to him having the success in the FA Cup with Forest. Billy sadly passed away in April 2011 on the eve of the Championship game between two of his former clubs Nottingham Forest and Burnley. A minute's silence was impeccably observed ahead of the game.